Goa have an annual conversation that goes along these lines. Rajesh gets in touch with Viraj whjo might send a text to Sachin, a call might then go to Vijay who in turn will wonder what Pradeep is doing, knowing very well that he too has holi on his mind. During this whirl of activity, Lloyd Braganza of House of Lloyds will be asked to move his rear and haul himself to the Pine tree shack in Candolim. 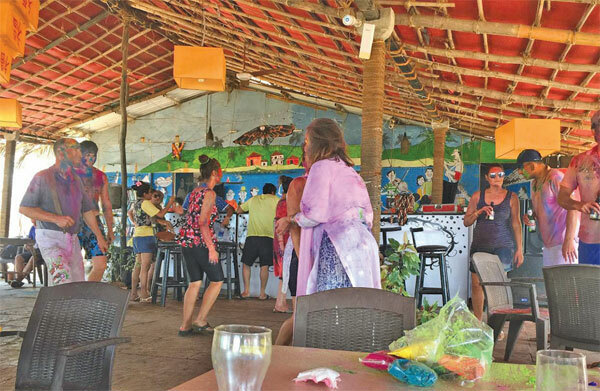 And virtually each year, this little Goan shack becomes an almost impromptu celebration of folks for whom holi is big in the states and cities they once lived in and who call Goa home. And their Goan friends celebrate holi with as much gusto, much like homes of people and other resorts and shacks are. Deepa George who has lived in Goa for several years now said she did not celebrate it herself but her sons who were both in primary school would certainly do so in a school group. With now so many north Indian families living in Goa, she said the culture was certainly spreading and her boys would certainly play. She also said “I have seen several foreigners being part of the celebrations”. That does not seem to be a problem for Vijay Jhangiani, who just returned from Mumbai, with special large jaleebis which are consumed on holi. He said “I have been here for seven years and this time, we will all be meeting at a shack and we will then start partying. And all that goes with holi will be partaken”, he says with a boyish glint in his eyes. Jyoti Saxena will celebrate Holi as a typical North Indian. It will mean organic colours, great food with family and friends. Invites have been sent out to a lot of people. Fellow punjabis, kannadigas, malayalis have all received invites and yes Goans too. Jyoti said “We let our hair down on such occasions and family and friends around is there a better opportunity”. Perhaps the final word should go to Mona Malovalia Crisanto, a sardarni married to a Peruvian and now living in Goa for five years, the festival will be a great opportunity for her children to get messy at the five star resort party and play with water pistols. More importantly interact with other children and have fun and yes eat some great food. Everyone joins in on the great Goa holi-thon.